I was thinking about something LA said this morning in her blog. It led me to contemplate the proverbial fork in the road. We’ve all been there, haven’t we. We’ve arrived at a point in our life’s journey where we must decide which way to take. We’re standing at a fork in a road that forces us to choose which way to go. Without knowing what lies at the end of either choice. We can either go left, or we can go right. Sometimes, the condition of the roads might give us clues as to what lies ahead. If one road shows to be a clear path leading into sunshine, and the other a bumpy road full of pot holes and boulders, covered in dark cloud, which road would you choose? Does the state of the road give you insights as to what lies at the end of it? I’ve been thinking about this a lot lately. About choices, about decisions, about what-ifs. Up until perhaps six months ago it was a no brainer that I would choose the comfortable road that looks easy to travel on. The one that doesn’t suggest surprises, unpleasant or otherwise. I liked my comfort zone, and the implied easy road to get somewhere. I wasn’t equipped, emotionally or mentally, to purposely pick the harder journey. I was tired. Raising young kids in a house I don’t like while struggling with this ongoing hearing issue has done a number on me. It chipped away at my identity. Now, the teen years are upon us and it’s a whole slew of new challenges. I’m still tired, but in a different way. And despite the fatigue, which is more mental than physical, I have found some time to rediscover who I am. Or, more correctly, who I have become. All this has happened within the past half year or so. Partly, this blog’s community is reason for this. You, the ones who take the time to comment and like things I write, you have opened my eyes, and my perspectives, in ways I never thought possible. I ❤ you for this. Perhaps I’m more selfish as a result. Not at the expense of anyone, but rather as a way to finally allow myself to be *me* in all the ways I wasn’t before. I’ll tell you something. If you feel inhibited about a certain aspect in your life, I encourage you to write about it. Write it someplace where no one will see it. I do this in Evernote. I take a topic I’m shy or concerned about and I just empty my thoughts into the keyboard. 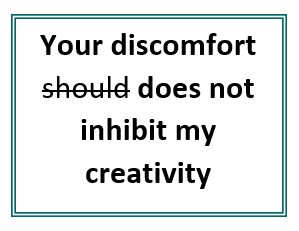 This is really hard to do initially because you will find yourself stumbling over words that give you discomfort. Let’s say you have a body image issue. Writing about that is difficult because certain words that describe parts of your body you don’t like will create an emotion in you that you will want to avoid. So you may type out the word, then delete it because it’s too uncomfortable to see it there on the page. Write it anyway. Type it out. Go to a thesaurus and look at synonyms of that word. What I’m getting at is that as we journey though life, we often choose the comfortable, easy way toward some goal. And this is fine. We’re all tired from the demands that are dished out to us on a daily basis. Family life is not for whimps. Yet…wouldn’t it be nice to choose a less traveled option one day, just to see what it will bring? Navigate a different path for once? Take a brick or two out of the wall that surrounds and protects you simply to add a new experience into your life? If we don’t do this now, then when? I do this with my words. How do you do it? And if you haven’t started, do you think you might want to at least consider? I’m so behind on your posts. Trying to play catchup this morning! I write a lot that I don’t share and agree that just getting it out can be very transformative. I have spent my whole life agonizing over every decision that came as a “fork in the road” moment. But, the older I get, the more I trust myself. Sometimes that more rocky path leads to amazing things. Sometimes the easier path leads to amazing things. I think I’m beginning to realize that it’s not necessarily the condition of the path, but the condition of my mind that determine how difficult traveling it will be. I love this. It’s about not settling, isn’t it – about challenging yourself. I think sharing your thoughts on a page, even if no one sees it, helps you to organize what’s running through your brain. I am fond of saying that I always do things the hard way. Cuz I do. It’s exhausting. But I do ever so much growing as a result. (I think…hahaha!). I enjoy your posts! I find your blog very insightful and always interesting to read. (I like LA’s blog too for the same reason – and I see you two are friends!) I’m sorry to hear you suffer from a hearing problem……and don’t like your house (sometimes I don’t like my house either as I really need to finish renovating it!). I like the idea of taking something you are dealing with and writing a fictitious story about it. You are at a very busy stage of your life, where it’s difficult to find “me” time, so good for you for taking that time and doing something creative you enjoy. Thank you for your kind words. I feel a little neurotic sometimes! Writing is a big thing for me too. It has always been, apparently, but I am recently realizing this better with my blog. I agree! Fortune favors the bold. Do. It. Now….If not now. When? Your comment about being more selfish strikes a chord with me. Over the years I have become more comfortable with being me and less concerned with fitting in with other people’s expectations. Thank you for writing fun things to read.